When you bought your Porsche you were expecting a high performing German sports car. Apart from your standard maintenance, you shouldn’t need to worry about issues popping up in a brand like Porsche, right? Well, it turns out that Porsche cars do have some common problems that owners need to be made aware of. One of the most common problems addressed by Porsche owners is coolant leaking, or problems with the heating and cooling of the vehicle. Coolant leaks in any vehicle could lead to costly repairs if not addressed. Why are Porsches more prone to coolant leaks and what do you need to know as a Porsche owner in order to keep your vehicle running in top condition? Porsche Cayennes and Panameras built between 2002 and 2006 were built with hard plastic coolant pipes. These pipes could not handle the heat from the car and led to leaks. Additionally, the location of these pipes inside the tightly packed engine just under the intake manifold meant the pipes were subjected to more heat as air flow was restricted. The problem has since been addressed by Porsche, but how do you know if your car is susceptible to this issue? In most cars, owners may notice a puddle of fluid when they pull away. The odorless, colorless liquid leaking from the front of the car could be coolant or it could also be condensation build up from the air conditioning running. It can be hard to tell if a trip to the mechanic is required to rule out any major issues with the functioning of the engine. 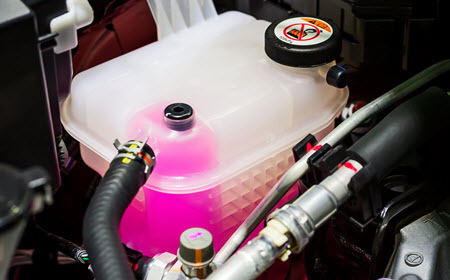 In a Porsche, the coolant fluid is actually pink in color and it will be leaking towards the back of the engine. If you notice this pink fluid it is important to get to your trusted mechanic to have this addresses immediately. Why Worry About a Coolant Leak? A coolant leak might not seem like an urgent issue to address compared to other problems that occur with all vehicles. However, any fluid leaking from your vehicle is something you should pay attention to. Coolant repairs are relatively inexpensive when addressed early, but they can do serious damage if left unattended. Coolant is necessary to keep the temperature of your engine under control. Leaking coolant could lead to your engine overheating which could leave you stranded. Apart from overheating, if coolant leaks into other areas of your engine, it could mix with the many fluids required to keep your car running smoothly. If coolant mixes with other fluids in your car like oil it could lead to corrosion in the engine as coolant does not act well as a lubricant. While these are possible issues in any vehicle with a coolant leak, in a Porsche it could lead to major repairs if not addressed due to the engine layout. The location of the coolant pipes in a Porsche allow for leaking fluid to pool in the engine at the base of the “V” until it spills over onto the rear of the engine over the transmission housing and the starter. These spills can do major damage to the starter that, if not addressed, could completely ruin the starter. The average cost for a coolant leak diagnosis ranges between $44 and $56 with repairs running about the same. Costs to diagnose and repair a starter however are much higher, falling around $800-$1200 for diagnosis and repair with cost of parts at about $800. As with any vehicle, ongoing maintenance is always recommended. Your automotive technician will be able to spot small problems before they become big ones, which keeps your car in good condition and keeps you safe on the roads. While you may already be taking great care of your Porsche by taking it in for its recommended scheduled repairs, our ASE Certified Technicians at Revolution Automotive Services, Norwood, Westwood, Walpole, Sharon, Canton, Medfield, Needham, Dover, and Boston, MA are aware of the specific needs of your vehicle and will take the time to check for these issues. Our expertise in the maintenance and repair of BMW, Mercedes, Audi, Porsche and Mini Cooper vehicles will help you avoid any costly repairs and keep your vehicle running at peak performance.